It’s our exciting, annual Puppy Bowl game! 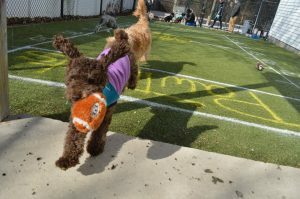 This year, the Pawtriots will take on the Ruffs in a thrilling nose-to-nose showdown on the gridiron! The dogs’ final score will be Pet Dominion’s official doggie prediction for Sunday’s big game! We’ll also have tailgating and more. And, all of the excitement is included in our regular daycare rate! For more information on this exciting event, give our reservation specialists a call today at (301)258-0333.